Content marketing is the “IT” thing of internet marketing right now. 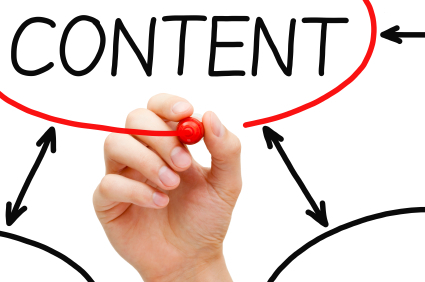 While content marketing is not new by any means, recently it seems to be the buzz word of 2014. Luckily for us, it’s not a buzz. It’s the basis of our business. I mean come on, our name is ConvertWithContent. And the truth of the matter is content has been and will always be the foundation of marketing. You need content in order to survive in business. You need content to explain your services and your products. You need content to stay in front of your customers. You need content to bring in new customers. You need to use content to market yourself and your business. You need a content marketing strategy. Bottom line. According to some studies, content marketing is 62% less than traditional marketing but results in 3 times as many leads. That means if you are creating content at a rapid pace you are losing leads to your competitors who are. So what types of content can you use to market yourself and your business? You see, everything is content and all this content can be used to bring you leads, sales and returning customers. What types of content do you use to market your business? The forms on your site for talking to you about Blogging are rejecting being submitted. Though you should know. Thanks Chuck. I apologize for that. Are you interested in blogging? This is absolutely useful post. Currently we focus and emphasize more on Slideshares and we get good result from it. We plan to give a try to inforgraphics and guest blogging. What do you think which is better infographic or guest blogging? Thanks and waiting for your reply. Stephanie, this is a great article. Easy to understand, and brings out key types of content every marketer should utilize. Thank for posting this!